Hayley Mills, Allison Jean White, and Brenda Meaney in PARTY FACE at City Center Stage II - Photo by Jeremy Daniel. Ladies, time to put on your party face! Smile so people you don't like will like you! Or so women have always been told. 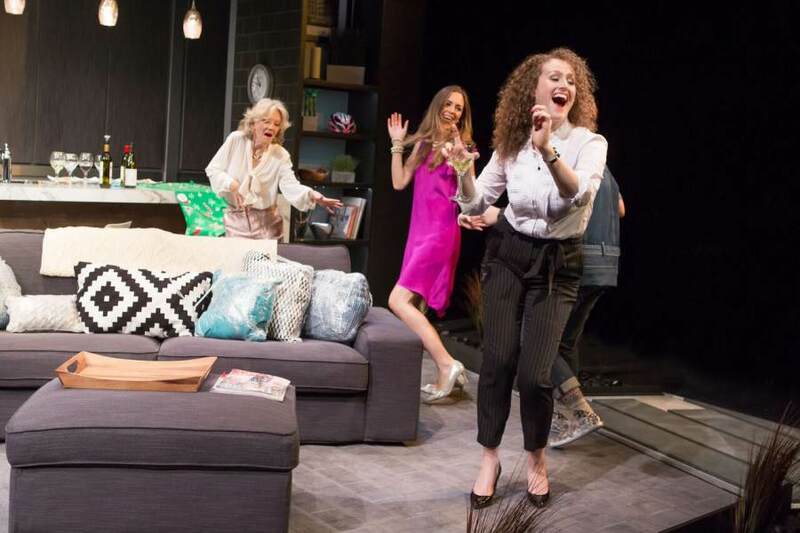 Party Face, a clever, astute new play written by Isobel Mahon and directed by the impressive Amanda Bearse, is a strong, insightful play about who women are behind their party faces, even while other women are encouraging them to keep that party face front and center. In an aspiring suburb of Dublin, Ireland, Mollie Mae (Gina Costigan) is getting ready to host a small party in her beautiful new kitchen extension (a gorgeous set by Jeff Ridenour). This is her first party in a while, and for good reason. She has been "away" for extenuating personal reasons, which become revealed to the audience in due time. The attendees include her lovingly critical mother Carmel (Oscar winner Hayley Mills), who arrives early to help get everything ready, for Mother knows best and Daughter, decidedly, cannot possibly be ready in a way that will impress Chloe (Allison Jean White), whom Carmel has invited because she lives two doors down (and damned if she is not a younger version of Carmel herself). This delights Carmel to no end, particularly as her elder daughter Maeve (Brenda Meaney) enters the scene. Smart, sardonic Maeve, dressed in businesswear, is the antithesis to fluffy fuchsia-clad Chloe; the two have moved in the same social circles for years and are certainly not glad to see each other. Completing the cast is Klea Blackhurst as Bernie, the warmest, most well-adjusted character of all, who clearly has all of her own problems (including an affinity for clingwrap) but has faced and embraced them. This frees her up to be the truest friend of all, even to those she has just met. The cast is all women, with men and children mentioned only in dialogue. This keeps the focus on women's relationships to each other when men and children are not demanding their attention. Even without their presence, the women's relationships to their families are never far from their minds, but how they feel about it and themselves is brought into sharper relief. Gina Costigan is quietly sympathetic as the self-effacing Mollie Mae, who seems to be hiding in her drab comfy clothes, struggling with whether she even wants to bring herself forward in a room full of strong personalities, even if doing so may be her salvation. Hayley Mills plays Carmel to the hilt as that inspirational, glamorous matriarch who will never reach that "certain age" when society expects women to pack it all in and forget who they really are. Her delight at being catcalled on her way to the party is truly moving. Allison Jean White as Chloe is so fluid and hilarious that you hope her annoying character never leaves, even as you feel the other characters' pain. Brenda Meaney as Maeve really brought forward a character who could have easily been dismissed as too uptight to be more than a stereotypical put-upon elder sister. There is far more to Maeve than her strident walk and sensible businesswear would have you believe when you first see her, and Meaney does excellent work making the audience care about her backstory. Klea Blackhurst is sure to have left every woman in the audience wishing they had a friend like Bernie in their lives. Her rendition of Bernie as a damaged but lovable wife, mother and friend is the epitome of what every woman constantly knows herself to be, and it is cathartic to watch her live that truth with such enjoyment. This is one show for which everyone should put on their party face and immediately buy a ticket for themselves and a friend.